A climbing group was exploring the feasibility of the East Ridge of Mount Washington. A foothold broke loose. Our beautiful day went south. Five of us were hoping to climb the upper East Ridge of Mt. Washington as a new entry in the list of Basic Rock climbs. Not certain where the climber’s path went, we bushwhacked up to the Shield Wall. We were just starting to ascend the gully to the right of the wall, from the top of which one can traverse to the East Ridge notch, when, at about 11:30am, a rock slipped out from under the foot of one of our party members. At the time, she was holding onto a hold with her outstretched left arm on the side of the gully. The sudden full weight on this arm dislocated her left shoulder. She did not fall, and there was no contact between the rock and her head, her back, or any other body part. She was in immediate, severe pain. We put the injured climber on belay and she descended the steep meadow below the gully under her own power to gentler terrain. At that point, I determined that a sling on her left arm would only make the pain worse, as would binding the straight left arm to her body; both positions increased her pain. One of the team had some old oxycodone in his first aid kit, and we gave the injured climber one, which did reduce the pain somewhat. About this time, our beautiful day went south and it started to rain. I used my cell phone to contact Mason County 911, who initiated a rescue. I was able to described our location as the base of the Shield Wall and estimate UTM coordinates from the USGS topo. Mason Co. emergency center activated Olympic Mountain Rescue (OMR), who sent folks to the end of the Big Creek Road, along with a sheriff’s deputy. After a group discussion, I decided to send two of our climbers ("messengers") back down our route of ascent to meet the rescuers at the road and lead them back up to the accident site. I also left a message for The Mountaineers emergency number, and contacted my wife. Reception was poor the whole time, so many times the calls were dropped. After the two messenger climbers left, we two remaining climbers found a dry spot sheltered from the wind under some stunted trees and helped the injured climber move there. We gave her oxycodon at two-hour intervals and made sure she ate and drank. I did assess her vitals twice; pulse was normal and no signs of shock. The key thing was to keep her warm and dry, and try to cheer her up. The rain eventually quit. After meeting with the two messenger climbers, OMR decided to request a helicopter. A chopper came from the Navy at Whidbey Island. It reached us at about 6:0 pm, circled several times to assess the situation, then hovered and lowered a rescuer on a winch. He quickly evaluated the injured climber, put a harness on her, attached her to himself, and the two of them were winched back up. All of this took about 10 minutes. The chopper flew off to Harborview. The two of us packed up the rest of the gear (we had all of the climbing gear, plus the injured climber's pack). Just as we started down, the two messenger climbers and three rescuers appeared below us. They took some of our load and we began the descent. 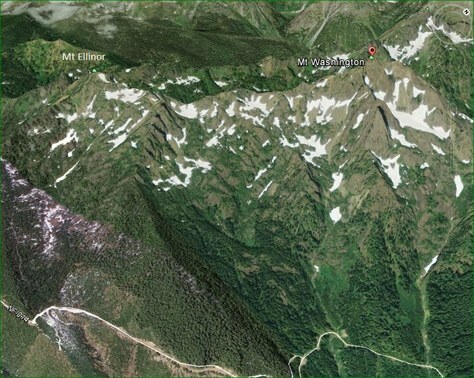 The rescuers knew where the climber’s path was, so the descent took only about 75 minutes. The next morning I called our injured party member and found out that she waited in the emergency room until 11pm before someone could reduce her shoulder. She was released at 1am. I can’t attribute this accident to anything other than bad luck. She was in good physical condition and had scrambling experience.